The Echo Dot is coming back in October, woohoo! The Echo Dot is available for pre-order through Amazon.com, with an expected ship date of October 20, 2016. Now you can have an Echo in every room, without having to actually buy an Echo for every room. You can buy 3 Dots for less than the cost of one Echo. The Dot sold out quickly last spring, and this is the first hint of its return. Considering how fast it flew off the virtual shelves when it was introduced, the Dot will probably sell out again. Hopefully, Amazon has a bigger heap of these things ready to go than they did last time. It’s back! And it’s got a lower price tag! These new Dots, branded “2nd Generation”, are mechanically identical to 1st gen Dots except for a white color option and a lower price. A white Echo is being added to the lineup, too, with an earlier release date of September 28, 2016. Get excited! The Echo and Dot now come in both black and white. What’s so great about Dot? All the same functionality of an Echo. Like Echo, Dot is always listening for your commands and responds to you audibly. If you’re reading this, it’s probably because you love your Echo and want more of it. The Dot is like getting more Echoes but for cheaper, and the tradeoff is the speaker isn’t as good. The Dot’s speaker is kind of like the speaker on your phone. However, unlike the Echo, you can plug the Dot into any better speaker, and this Voltron-like combination of powers might make Dot + Your Really Good Speaker a better deal for you than a single Echo. What’s new in the 2nd generation Echo Dot? This pre-order is open to everyone! This time around, the Dot can be ordered directly through Amazon.com, by anyone. The previous Dot was only ordered through an existing Echo and there was a stricter limit on the number that could be purchased by a single buyer. The 2nd generation Echo Dot has the same internals as the 1st generation version. Echo Dot, now with the burden of having to choose which color you want. Amazon’s got some sweet bundle deals for the Dot this time around. You can buy 5 Dots and get the 6th one free, thanks to a bundle deal currently offered by Amazon. (There is also a “buy 10 get 12 free” deal, which is basically the same thing but Amazon is currently restricting buyers to one multipack per customer.) If you have a big place or multiple places, or some cooperative friends, this is an awesome deal. What goes well with the Echo Dot? When the return of the Dot was first made known on Amazon, Amazon was also offering some sweet Dot + other thing deals. Amazon has since discontinued these bundle deals. Here are some things that I think go well with a Dot. What could be lazier better than telling your lights to turn on or off with just your voice? “Alexa, turn the lights on” is probably the first words our baby will learn because we say it so much around here. The Philips Hue starter kit comes with 3 rainbow bulbs and a hub. 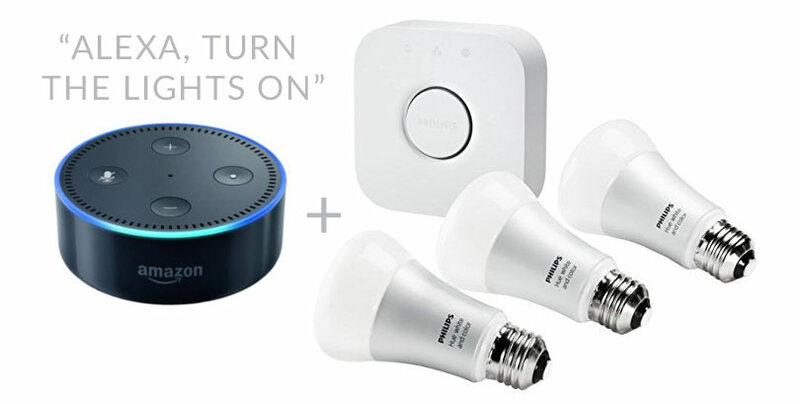 Put the Hue kit and the Echo Dot on the same network and boom – you’ve got voice controlled lights. If you aren’t convinced, check out our detailed Hue Philips Starter Kit review here (we love this lighting system so much, we’ve got it in both our apartment and our weekend place). 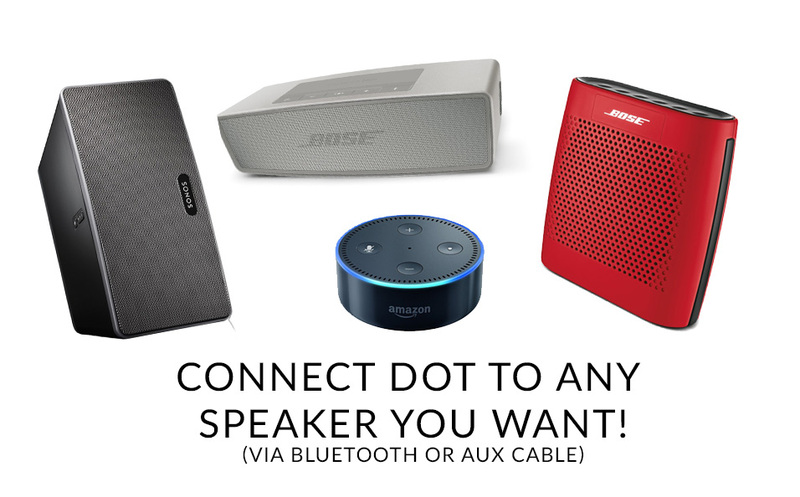 Something the Dot is good for is turning your Bluetooth or WiFi speaker into a voice-controlled speaker. 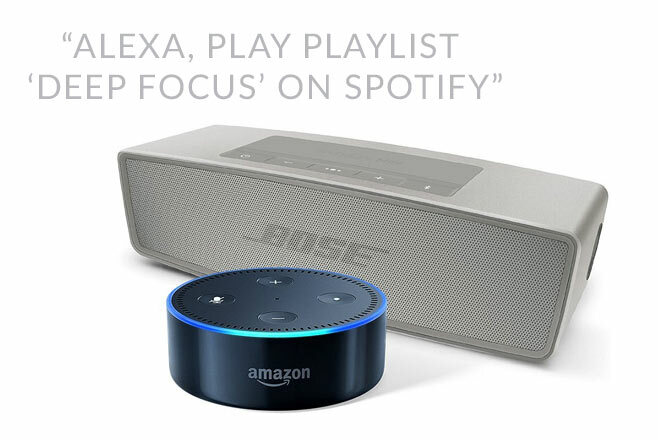 The Echo and the Tap only have so-so speakers, but if you want the best of both worlds (voice control over an awesome speaker), grab something like the Bose SoundLink Mini II to go with your Dot. Make any speaker into an Alexa-powered speaker with the Dot. This speaker is incredible, especially for its size. I’ve had my SoundLink Mini for a couple years now and it’s such a versatile, powerful speaker. I highly recommend it to anyone wondering which speaker to pair with a Dot. The SoundLink mini isn’t WiFi by default, but paired with a Dot, it can be. This means you can stream music over WiFi to it (such as through Spotify Connect), which offers better sound quality and connectivity over streaming through Bluetooth. My “mini” is currently acting as a soundbar for my TV, but when I travel or head down to the rec room I take it with me thanks to its small size and awesome sound quality. The Echo Dot is back and better than ever! Go get yours before they sell out!